David is very fortunate to have worked with many fantastic people throughout the UK and beyond during his travels as a magician. Here are some of the tremendous professionals, companies and venues he is very proud to know. The official photographer of Nottingham Forest and Notts County FC, John Sumpter can be contacted at http://www.jmsphotography.co.uk/ or call 0115 9391253. Carol is always ready to assist you with your special photo-shoots around Derbyshire and beyond. Visit Chapel Studio's website at: http://www.chapelstudiophotography.co.uk/ or call them now on: 01773 852277. The Quorn Country Hotel near Loughborough, Leicestershire, is a fantastic wedding and event location. The website is: http://quorncountryhotel.info/. Jemma, the wedding and events coordinator, can be reached at: 01509 415064. The city of Derby boasts a unique heritage and wide range of services. Situated in the heart of the historical old town, the Cathedral Quarter Hotel provides a welcome retreat for travellers with exceptional function facilities: http://www.cathedralquarterhotel.com/. Contact the wedding and event coordinator Susan on 01332 546 080. A tranquil yet accessible location make Hotel Van Dyk a very popular venue for weddings, parties and corporate functions. It has also developed a reputation for the exceptional entertainment it provides throughout the year. The website is: http://www.vandykcountryhotel.co.uk/ and Michelle the wedding coordinator can be reached at: 01246 387 386. Ringwood Hall is a vibrant wedding location close to Chesterfield and hosts exceptional events. Their website is: http://www.ringwoodhallhotel.com/. Telephone number: 01246 280077. Situated in a fantastic location on the banks of the River Trent, Brewhouse and Kitchen is a great place to relax. If you would like to find out more their website is: http://www.brewhouseandkitchen.com/venue/nottingham/. Telephone: 0115 9867960. Newark Showground has developed an exceptional reputation for all sorts of events. Visit their website at: http://www.newarkshowground.com/ or phone the events team: 01636 705796. 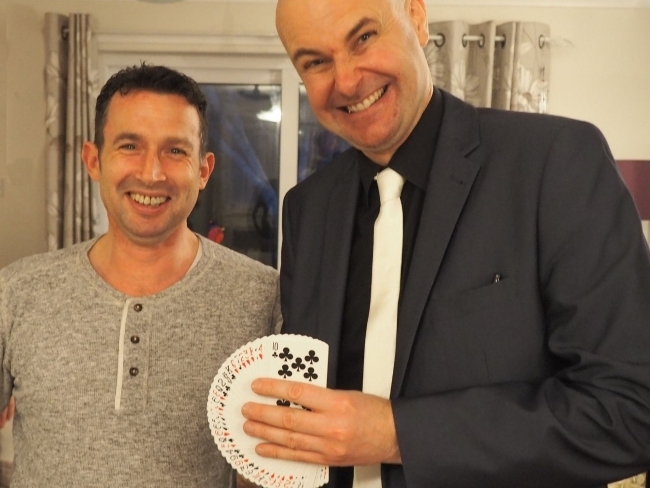 A blog article also reveals their extensive services: https://davidfoxmagician.wordpress.com/2016/03/24/newark-showground-an-outstanding-venue/. It is always a pleasure to perform at weddings at Kelham House Hotel. A tremendous venue with a very friendly and attentive team. Visit their website at: http://www.kelhamhouse.co.uk/ or phone them on: 01636 705266. Big Frog Films provide creative filming and photography for all sorts of special occasions. Their service is tremendous and they can be found at: http://www.bigfrogfilms.co.uk/ or phone Nigel now on: 07853 123133. If you are looking for a fantastic DJ, contact Craig now for an excellent service. Website: http://sheffieldweddingdj.co.uk/. Telephone number: 01246 812503. For spectacular chocolate fountains and a top class service, David is the man to call upon for your event. His website is: http://www.pure-chocolate-indulgence.co.uk/. Telephone number: 07427 668997. Louise is one of the most sought after wedding and event suppliers in the UK. For first class confectionery, candy floss, nachos and popcorn visit her website now at: http://www.sweetafayre.co.uk/. Telephone number: 07790 467948. Looking for an outstanding cake supplier? Strawberry Cupcakes offer a wonderful service for your wedding, party or corporate function. Visit them at: http://www.strawberrycupcakes.co.uk/ or phone: 0115 9989891. The musical talents of the James Green will amaze your guests at your next special event. Website: http://james-green.net/ and telephone number: 07810 514799. For exceptional catering services at all sorts of events, contact Steven and the team at Summerby's Catering: http://www.summerbyscatering.co.uk/. Telephone number: 0115 847 9083. Campbell Bass is one of the most sought after singers in the business. His website is: http://www.campbellbass.com/. Telephone number: 07815 179275. For outstanding wedding dresses and accessories, Shade Bridal of West Bridgford, Nottingham can be visited at: https://www.shadebridal.co.uk/. Telephone number: 0115 9822820. Linzi at That Black and White Cat Weddings is on hand to provide you with invaluable assistance: https://thatblackandwhitecat.co.uk/. Her telephone number is: 07399 081776. Cristina Lazzarotto is an outstanding professional make-up artist based in the Nottinghamshire area. Website: http://www.cristinalazzarotto.com/. Telephone number: 07793 613708. Pam's floral designs are simply spectacular and will enhance your special occasion. Website: http://www.pamgibson.co.uk/ and telephone number: 0115 5904045. Phil Cole is always ready to produce outstanding caricatures at your next important bash. Visit Phil at: http://coleyscaricatures.com/ or phone him on: 07879 243117. Seeking an exceptional book supplier in the UK who ships internationally too? Look no further: http://www.jermyandwesterman.com/. Telephone number: 0115 947 4522. See David's blog article: https://davidfoxmagicblog.wordpress.com/2017/05/17/jermy-westerman-a-fine-bookshop-in-the-heart-of-nottingham/. For top rate legal advice and an exceptional service, contact Peterkins, Robertson, Paul: http://www.prp-legal.co.uk/. Telephone number: 0141 331 1050. First class PC repair service and exceptional advice. Visit: http://www.bankfootcomputersolutions.com/ or telephone: 07747 794110. Wonderful venue decor and stationery is provided by the award winning Designs By Daykin: http://www.designsbydaykin.co.uk/. Always a pleasure to work with and experience their tremendous talents. Phone today on: 01246 241707.